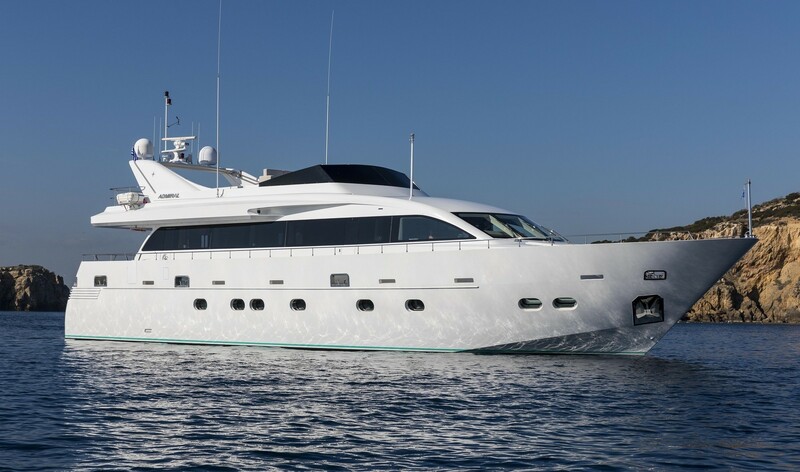 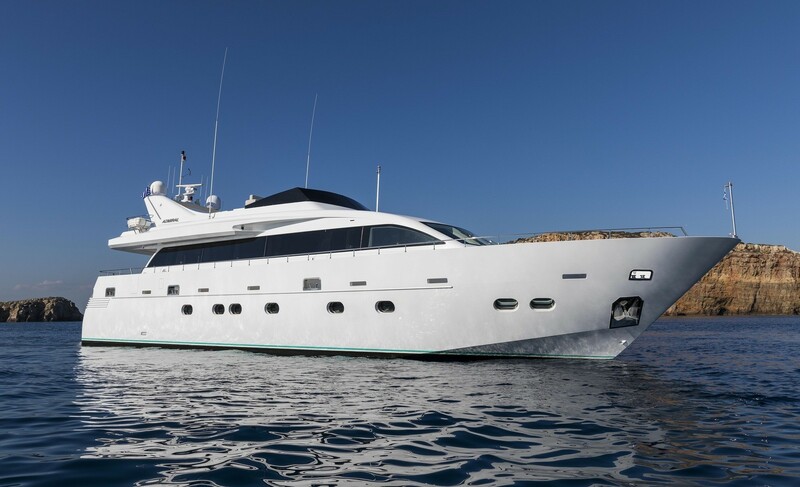 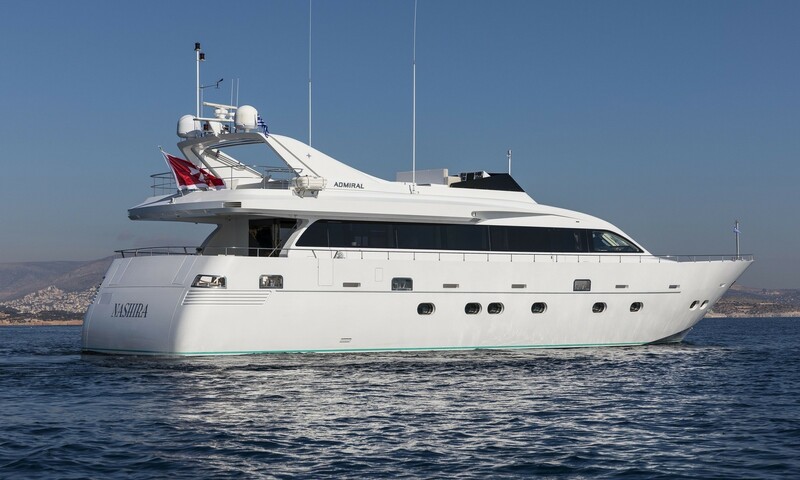 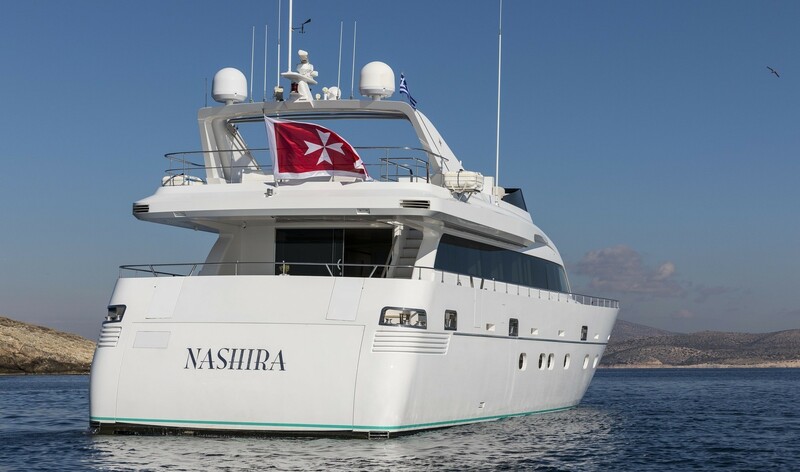 Motor yacht SALINA ( ex NASHIRA NV, Nashira) was built in 2008 by Cantieri Navali Lavanga, she measures 25,4m (83ft) and can accommodate up to 9 charter guests, in 4 cabins. 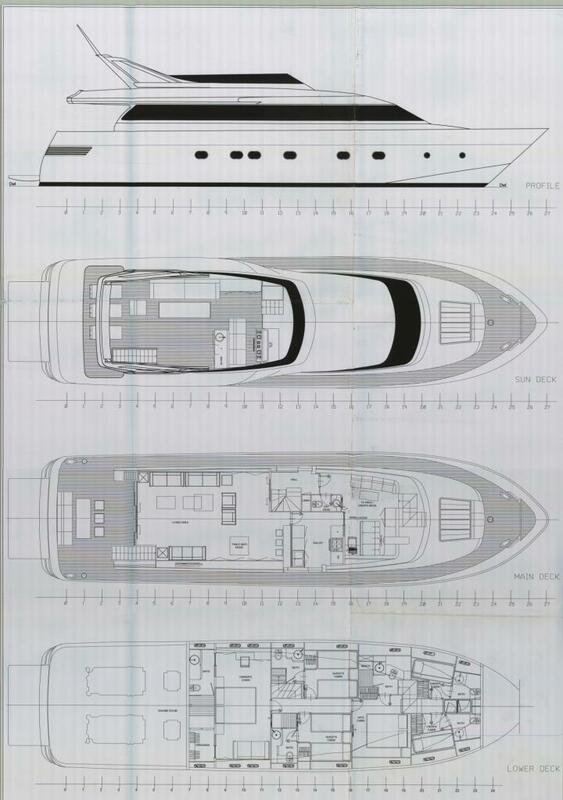 The naval architecture is by Admiral Engineering, she has an aluminium planing hull design. The interior styling is contemporary and elegant. 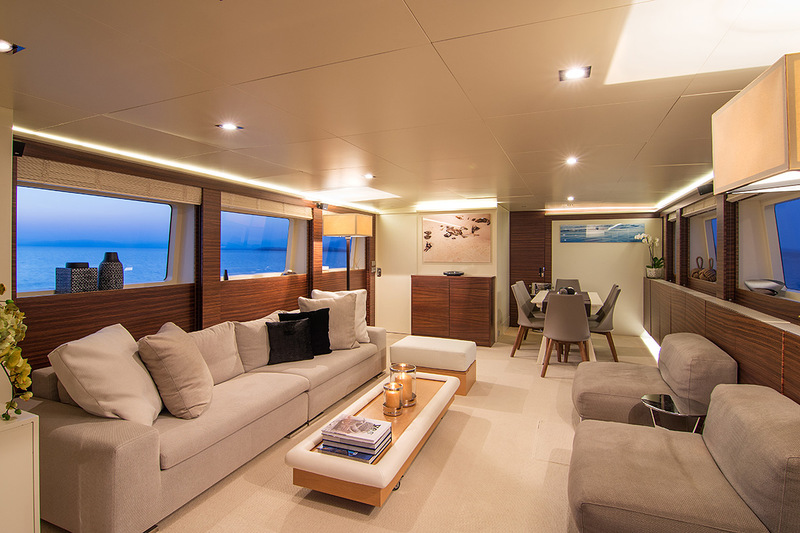 The main salon has an open plan layout, offering a generous lounge aft with a sofa, coffee table, opposing chairs and entertainment systems. 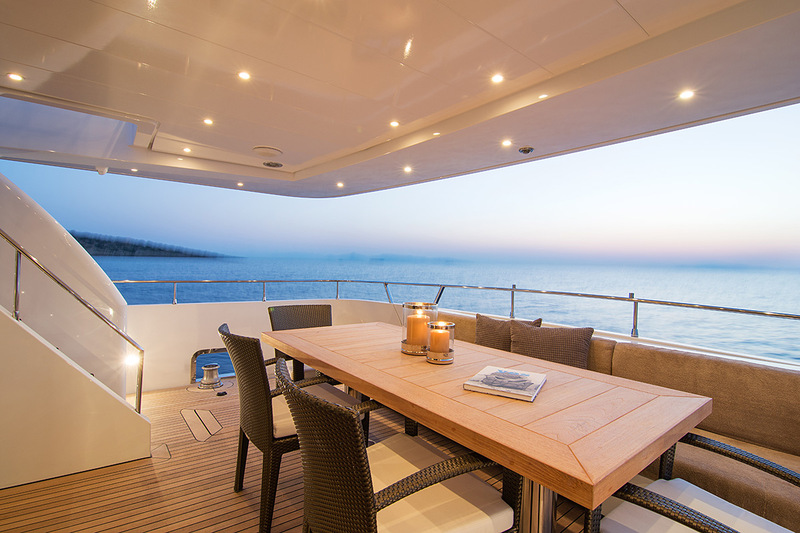 Forward is a dining area. 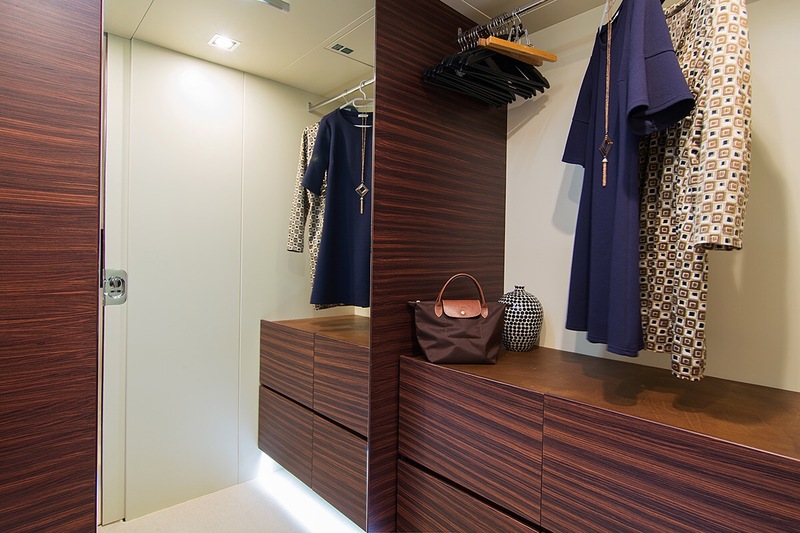 Her furnishings and flooring are finished in a neutral tone, complimenting the beautiful redwood panels. 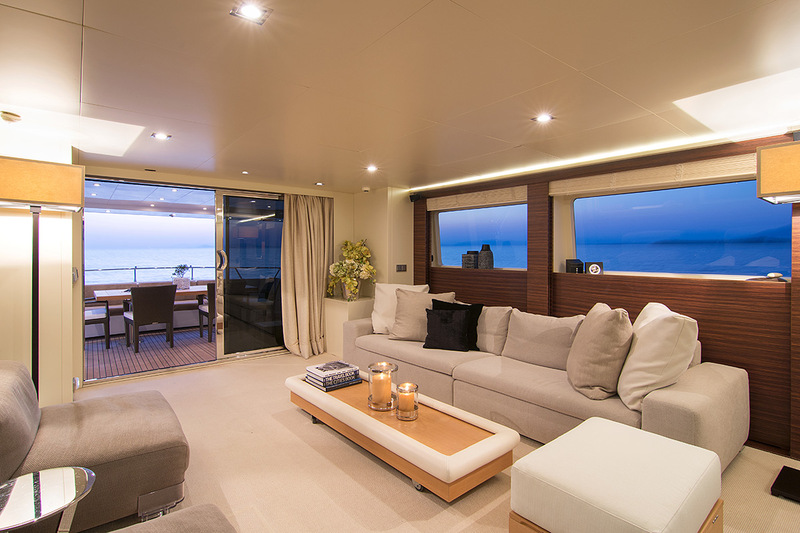 Surrounding panoramic windows ensure there is ample natural light by day. 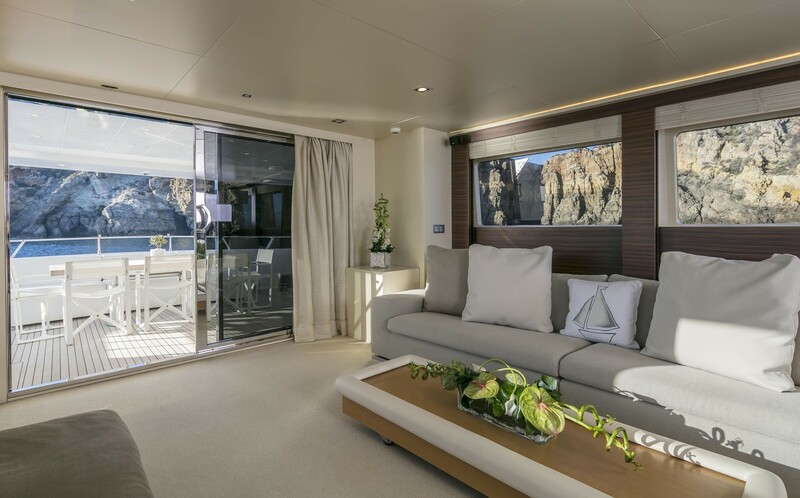 Further forward is the bridge deck, while below decks are the guests’ accommodation. 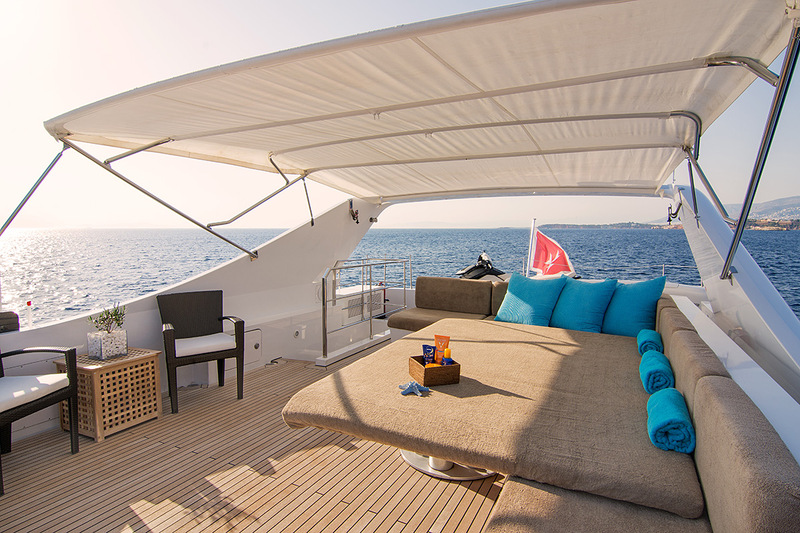 Exterior space is plentiful laid out over 2 decks. 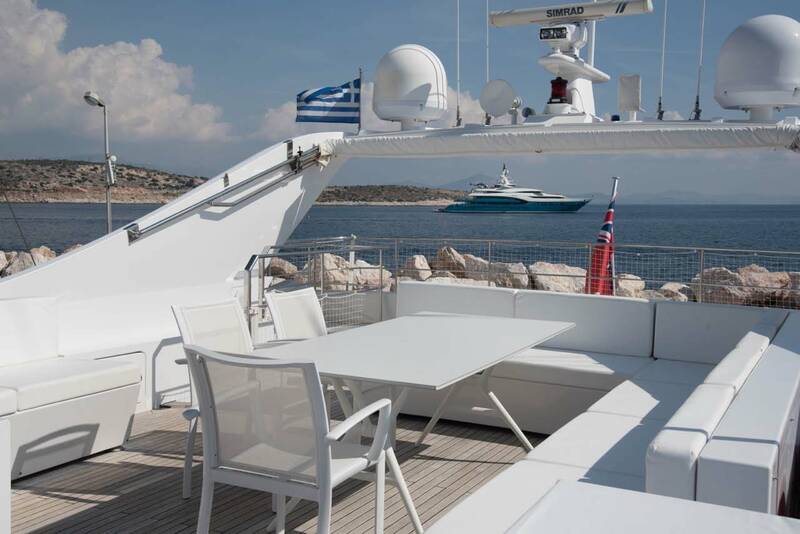 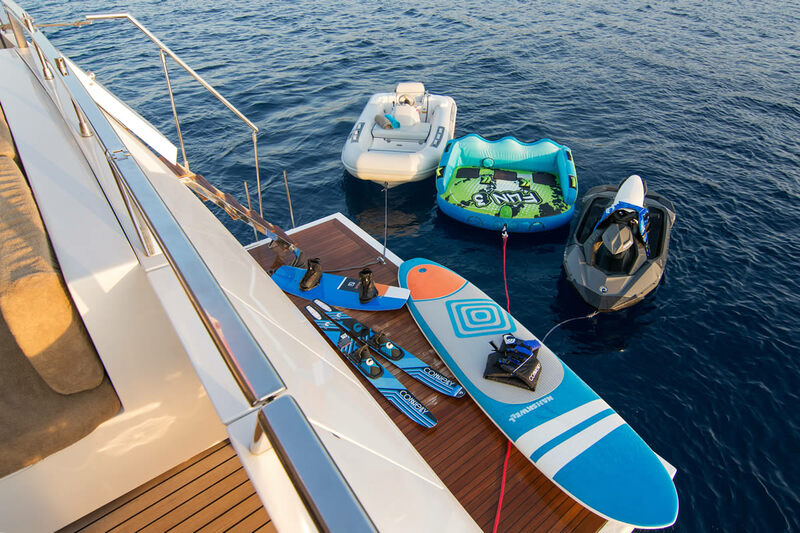 The aft deck is adjacent to the main salon, offering an alfresco dining option, seating, shade and direct access to the salon and stern swim platform. 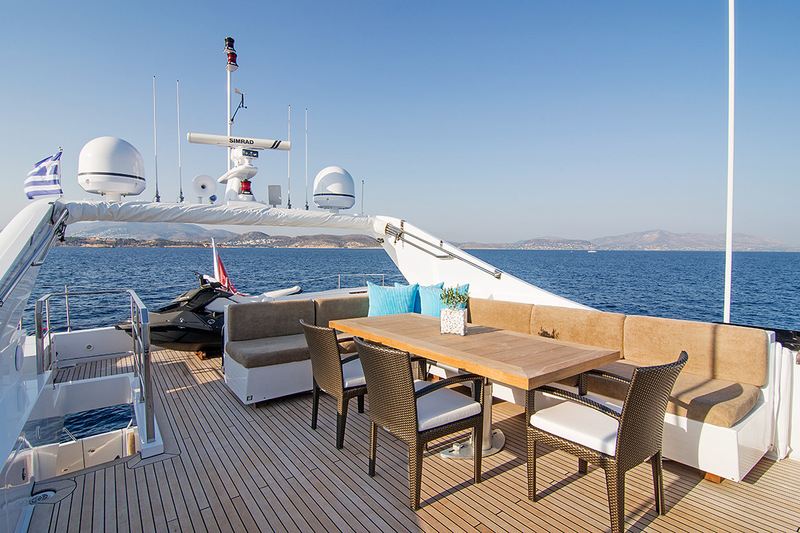 Side decks lead to the foredeck and a large sunpad. 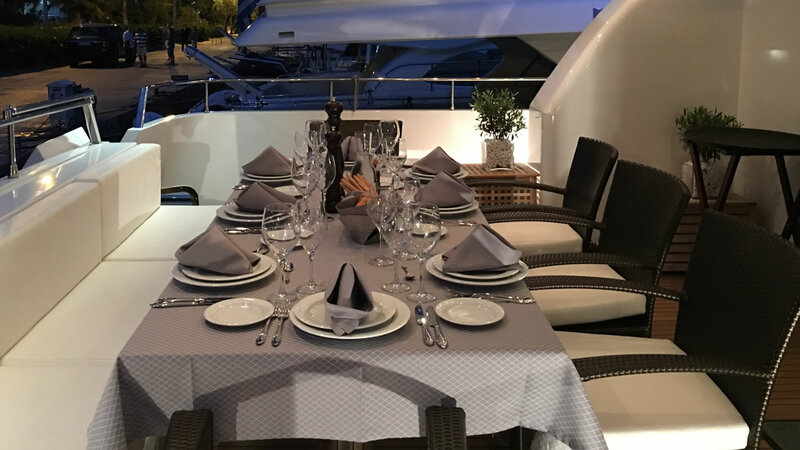 The yachts upper deck is great for socializing, featuring a further alfresco dining area, ample seating and sunning space and service area. 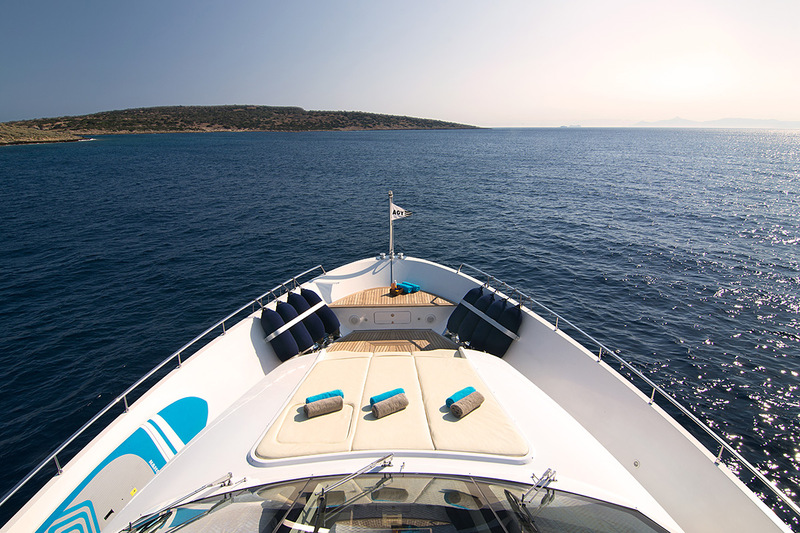 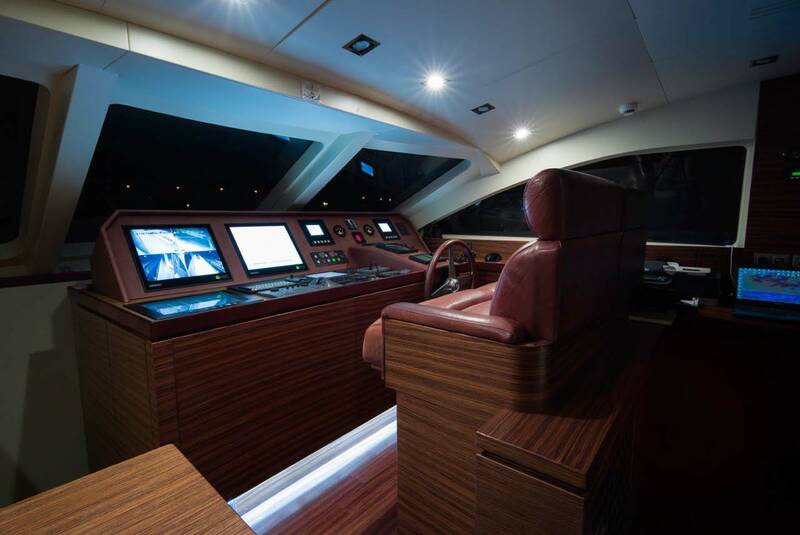 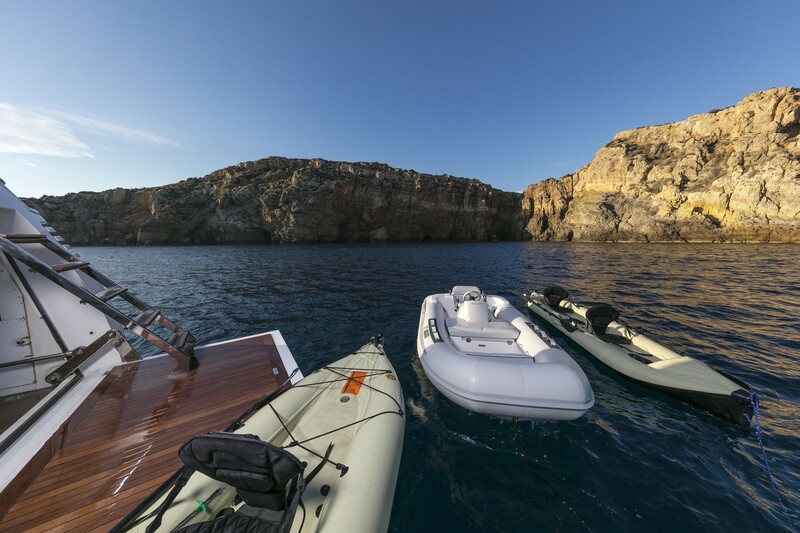 SALINA is powered by 2 2216hp MTU engines, capable of cruising at 25 knots, with top speeds of 30 knots. 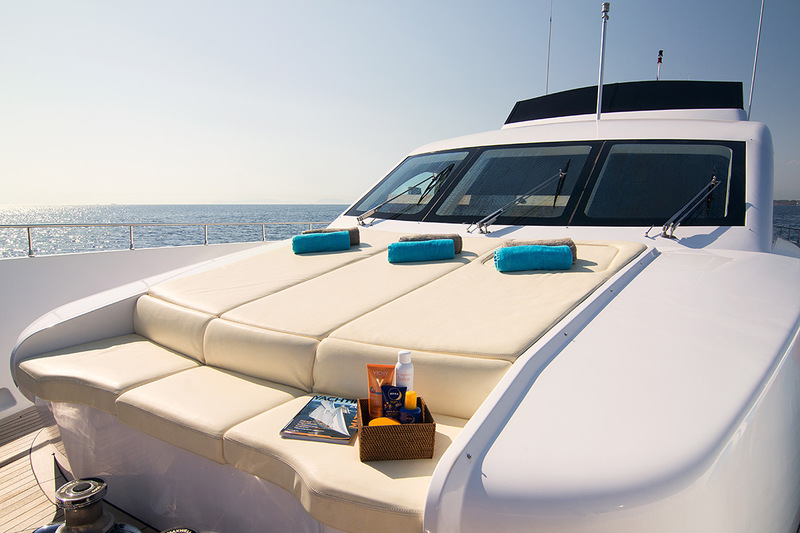 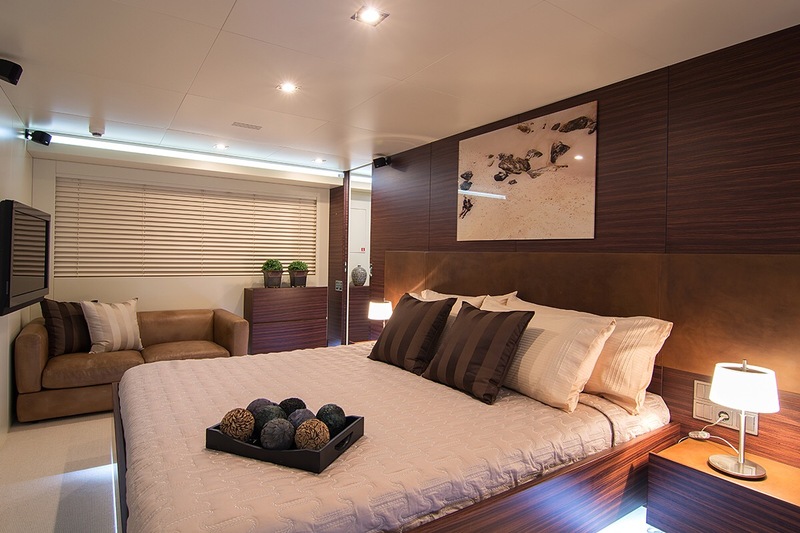 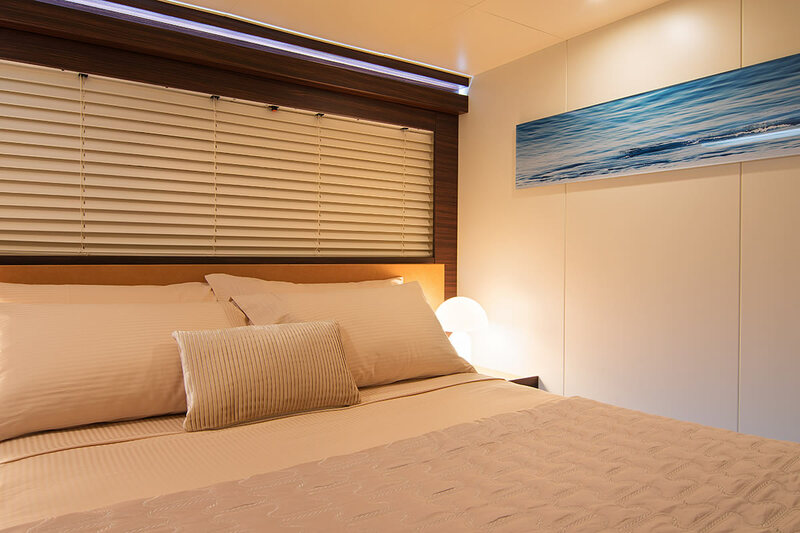 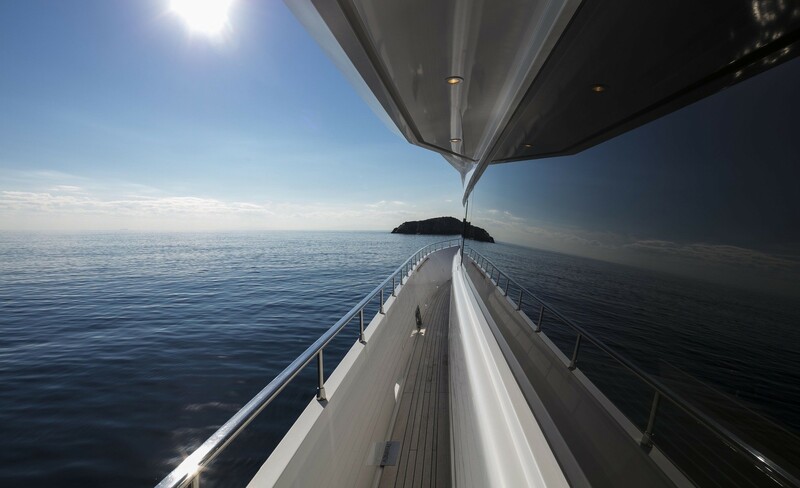 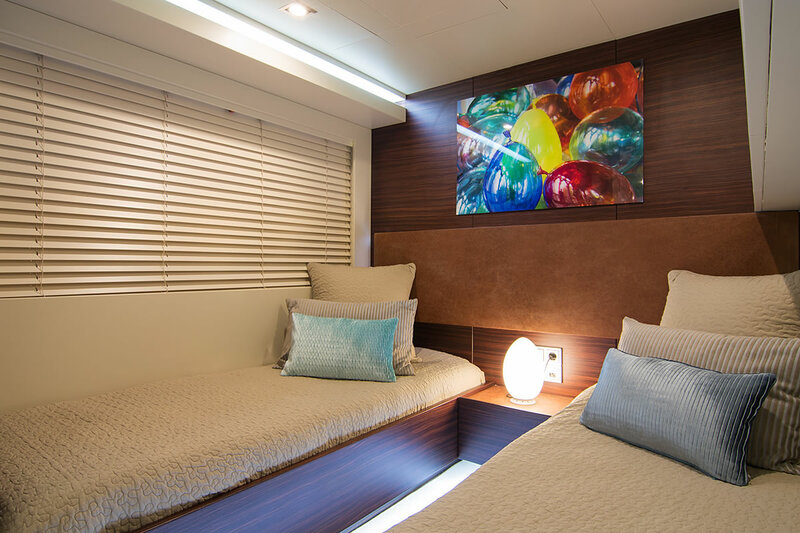 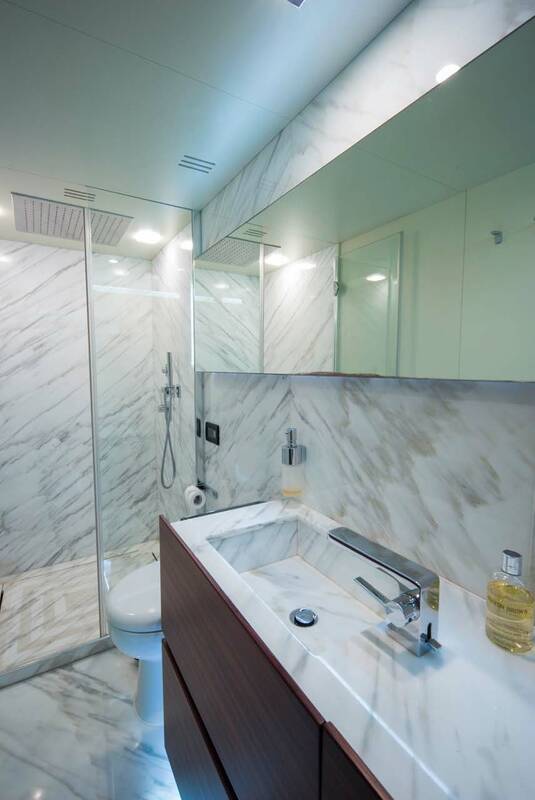 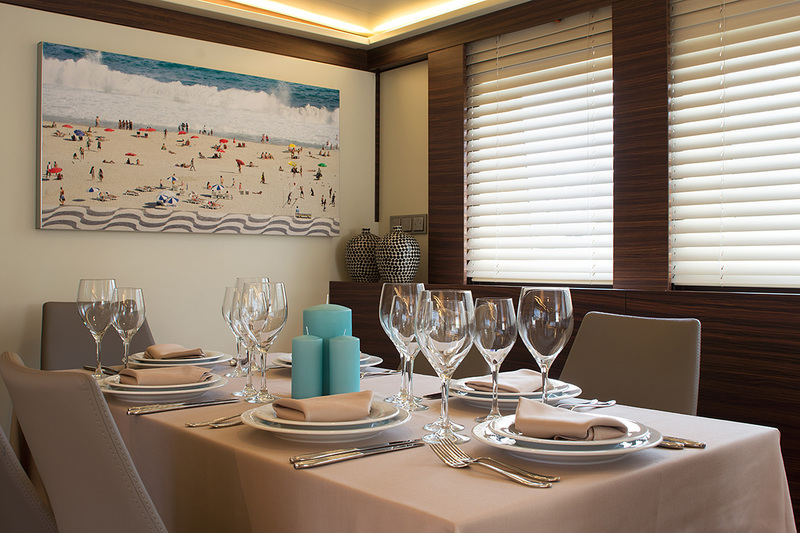 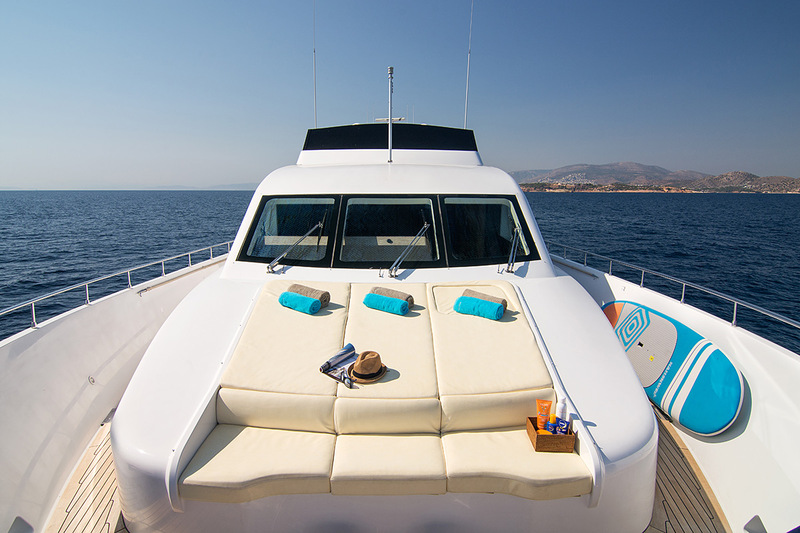 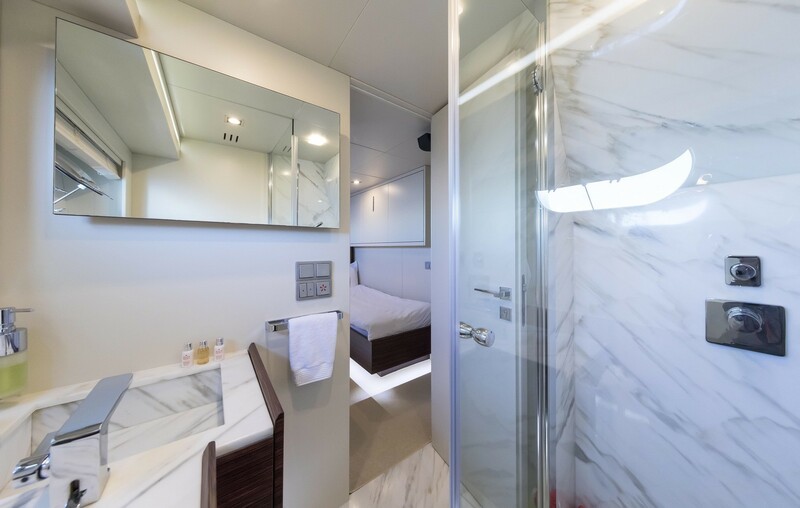 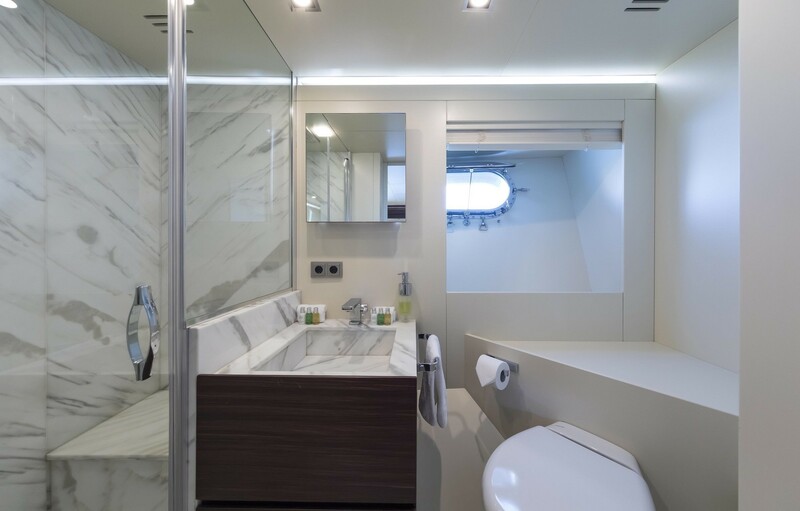 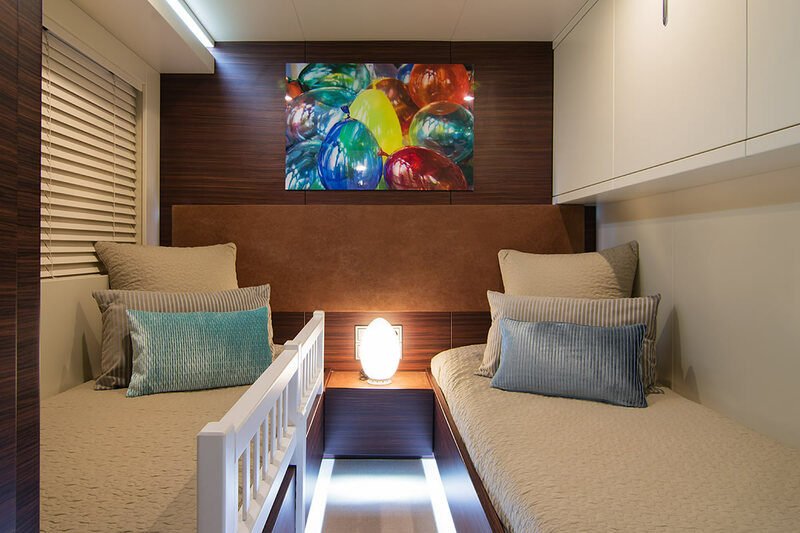 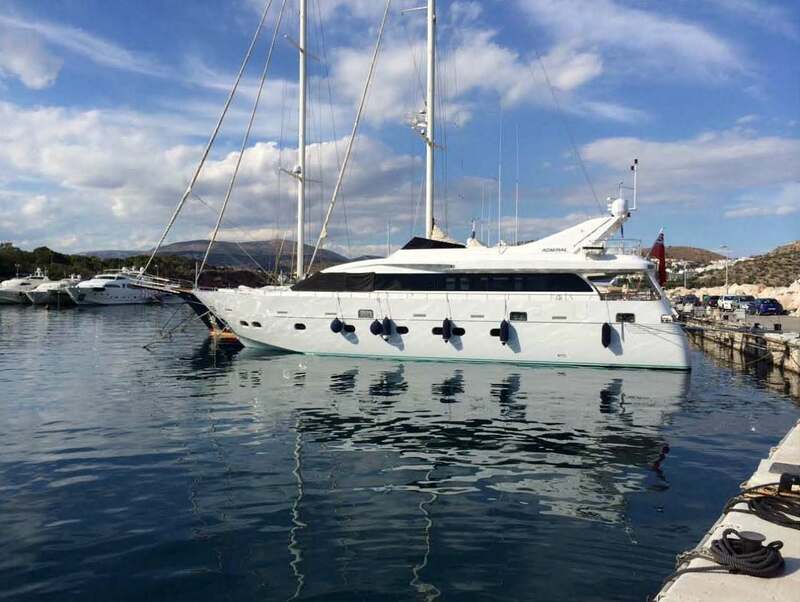 Accommodation is in 1 master cabin, which is amidships and full beam of the yacht, with a queen size bed. 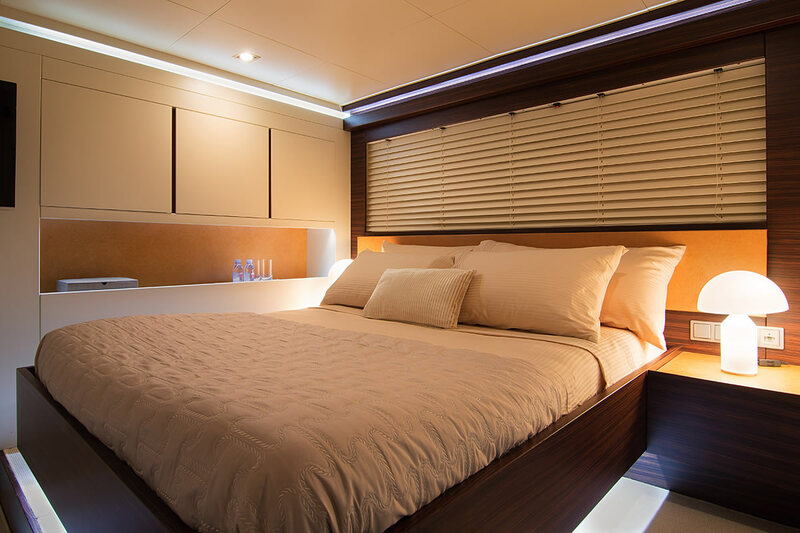 The VIP cabin has a queen size bed and is forward on the starboard side. 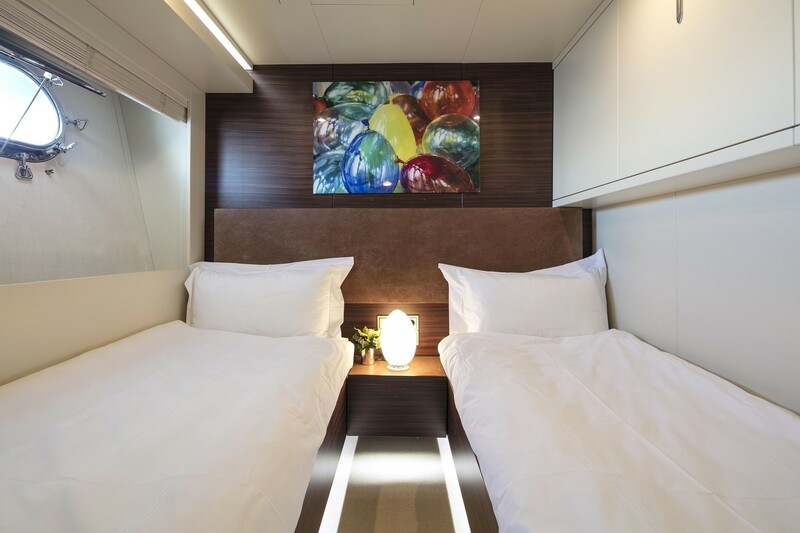 A further 2 cabins each have twin beds. 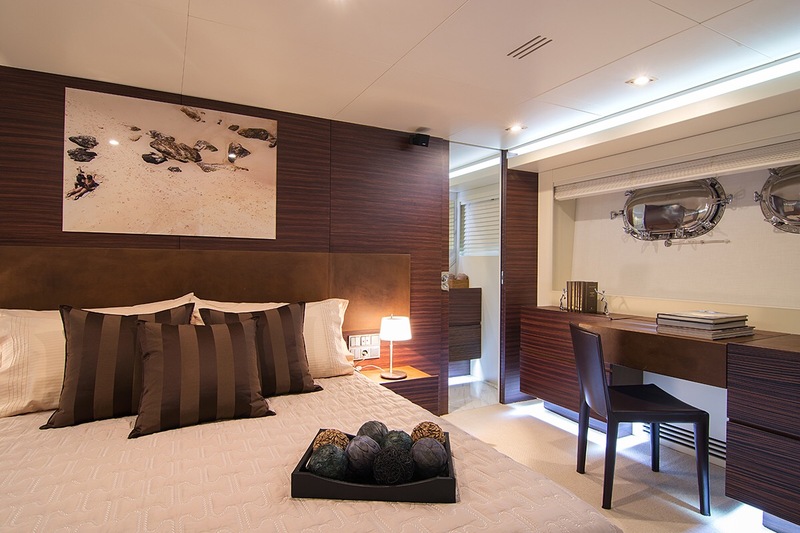 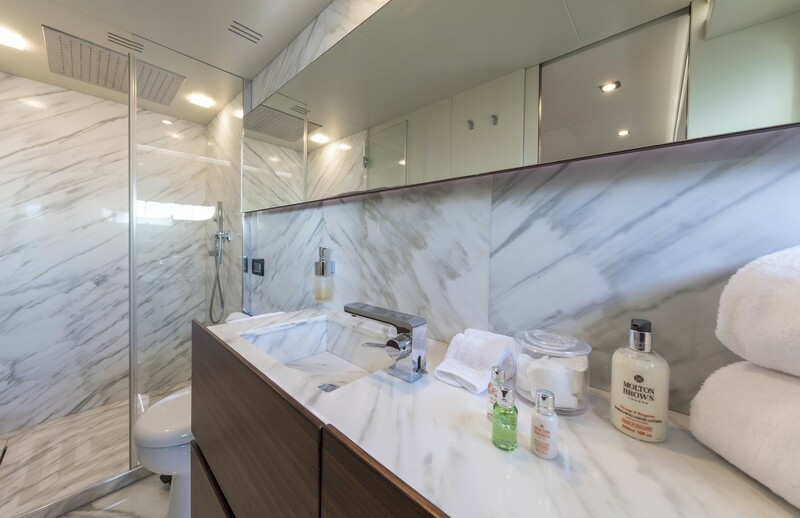 All 4 cabins offer private en-suite facilities.